Sometimes the body is just so tired it doesn’t seem to matter where I bed down for the night. In the past three months I’ve slept on charpoys, in a tent, a prison, abandoned buildings, police posts, a few lovely guesthouses, the odd memorable hotel and a few establishments that are struggling to reach even a one star status. I’ve shared my space with other travellers, lain in the desert under the stars alone and been ground to a paste in a sandstorm during the night. I’ve had a whole dormitory to myself and slept in a room so small it contained only the bed. When the urge to crash hits me, forget looking for a hotel…it’s hard enough to find one at the best of times.Sometimes anything that even barely resembles a bed can be inviting enough to crawl into – a roadside culvert for instance. Mattresses have ranged from comfortable to hard as concrete. I’m not an overly fussy person and I appreciated the times when sheets were snowy white. I’ve been grateful I had bike cover to put on the bed before spreading out my sleeping bag when the linen showed evidence of those who’d been there before me. There’ve been times when asking for a towel has been met with a blank stare as if to say the exorbitant fee being asked didn’t include extras! Waking up to a gorgeous sunrise in a chilly desert takes some beating. I’ve grown used to the early morning call to prayers in many places and fortunately I’ve managed to catch some shuteye through incessant noise of heavy traffic & passersby beneath my window, a cacophony of truck horns blasting and headlights flashing past the dhabas, and alarms going off at 2am in hotels. I’m one of those who likes to be early to bed and early to rise. I can smile now at how the smallest ray of light used to disturb my urban sleep. And here in Tehran, it’s a town that never seems to sleep. At 3am through the narrow lanes young Kurdish refugees are pushing carts groaning under the load of empty Sanyo crates, A rooster crows. With one eye barely open, the city roars into life beneath the snowcapped mountains, a majestic backdrop to this heaving city. I though, roll over and catch another forty winks. Plenty of clean towels in our bathroom. And hence you are heading this way, stop by and enjoy the snow white sheets on the spare bed. I enjoy much your writings and I agree with Faisal Amin. Riding a bike must be like writing poetry or vice versa? Keep on doing it. Thanks alot Andre, that sounds inviting for sure! So glad you’re enjoying following the ride. It hasn’t been without its share of bumps along the way but I’m definitely in the swing of it now! Yes, enjoying the sights. Heading to the Caspian Sea today by bus, as it’s pretty mountainous and not on my planned route. 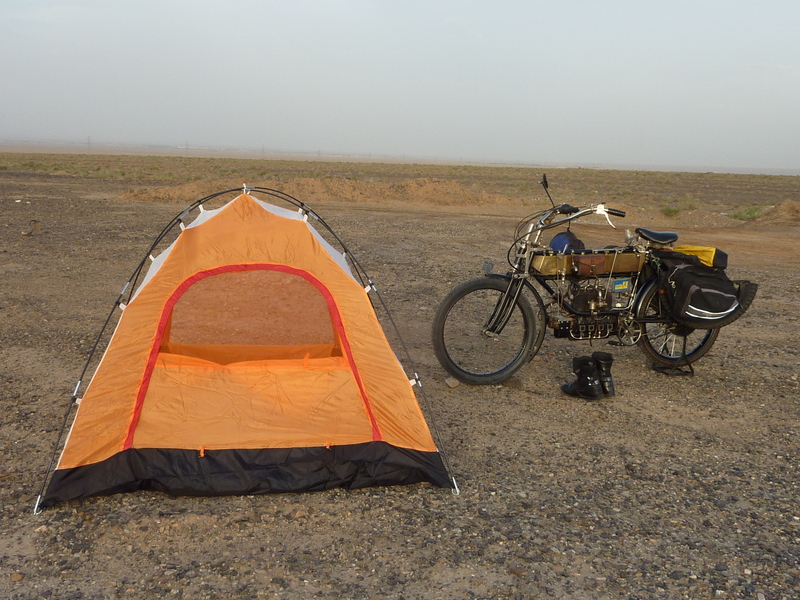 Will spend a couple of days there then return to Tehran and ride to Turkey. Looking forward to being back on the bike and seeing some different scenery. Will meet up with Lynne again somewhere in Turkey. Hope you guys are enjoying life. Thanks for staying in touch. 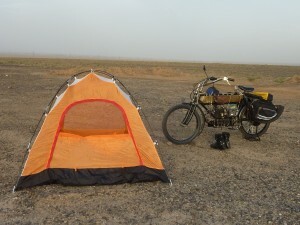 Ron, I love this image of the tent and bike with boots to the ready in the middle of nowhere. After these last few weeks the days spent in Tehran with Lynne will brighten your soul, and have you ready for the journey ahead. Love to you both. Hi Di, Yes, the picture pretty much says it all. Tehran was hectic, now in a quieter part of the country & heading north to the Caspian in a day or two. Lynne well again & we’re enjoying time together before I get back on the bike and ride to Turkey. Thanks for that. Will be good to have safe rubber to ride on again. Enjoying being in a decent hotel with a private bathroom after so many shared ones recently. Some great sights to see in Iran & looking forward to heading up to the north coast soon. LOL Faisal, not sure I’m responsible for any deep reflection. After our daily discussions my wife Lynne manages to convey my feelings a little more eloquently than I can. We hope that doesn’t change how you perceive my journey. Great as always to hear from you.